For many, an inheritance is typically physical property one inherits when one’s parents passes away. In some unfortunate cases, some family inheritances could also be a terrible burden and a responsibility. Would you choose to accept your inheritance if you were told to become a bomoh (shaman) just like your father? First published in 1997, Dark Demon Rising tells the story of kampung-born city lawyer, Shazral, who left his home in pursuit of his dreams and life only to receive a call informing him that his estranged father is dying. At his deathbed, Shazral’s father, a respected shaman of the village, begs Shazral to promise to care for his supernatural “inheritance”. So it comes as no surprise that the 20th edition of the book depicted the entity that Shazral inherits – a Hantu Penanggalan – on its front cover with a stylish purple keris across her face. Considering that a keris is used as a symbol of Shazral’s inheritance, having the blade across the creature’s face represents his fated confrontation with it. Imagine seeing this flying by in the middle of a highway at night. Image sourced. Thanks to the cover, it was somewhat predictable to me as to which female character was the titular demon in the story but it was less predictable as to what sort of demon it was. 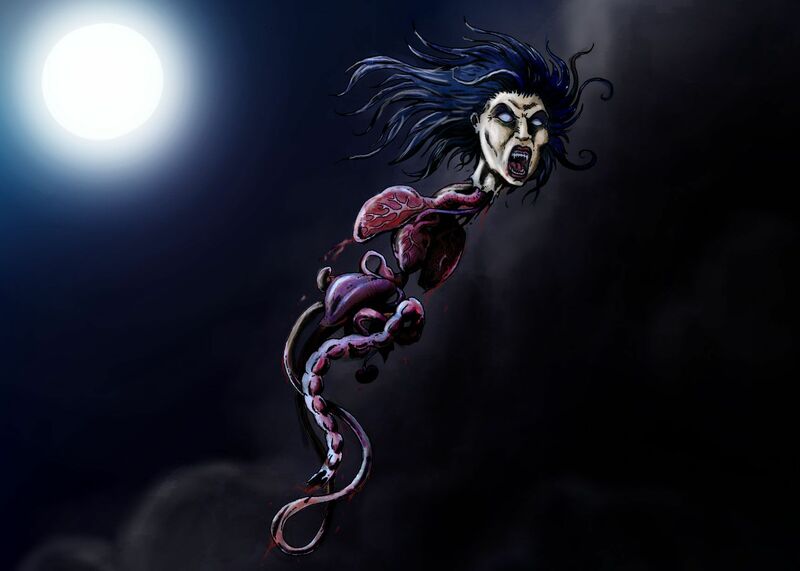 Although the name “penanggalan” is not actually used in the novel, but for those familiar with Malaysian legends, they can easily tell what it is based on the description (it’s a detached female head capable of flying about on its own). What I liked about Tunku Halim’s Hantu Penanggalan is that he expanded the monster beyond its myth, giving it traits not included in local legends to further emphasize its power and terror within the story. I can now understand why Buku Fixi chose to publish Dark Demon Rising. The novel was slow – I enjoyed the pace alot – but it is a page turner nevertheless. It did not take me long to go from one interesting part to another. I particularly enjoyed the chapters where the plot took place during Shazral’s childhood. The switching of the timeline was not too sudden and adds to the curiosity I had in regards to how the protagonist turned out the way he was in the present time. How does a bleeding finger scrape anyway? I had never seen such a thing yet my mind took the phrase and ran with it, filling itself with disgusting and horrifying images that made me more scared than I already was. Overall, it was an entertaining book that I would gladly recommend to others. There are moments where you will feel hopeless and empathise with the protagonist. Personally, this book is proof that there is still hope in the Malaysian horror fiction scene.